Once again, it's near the end of February. That means it's SP's birthday. I wanted to continue my tradition of baking him a cake, all by myself, and surprising him after work. But what kind? Previous cakes were Carrot Cake with Cream Cheese Icing (2009), the Lemon Cake Disaster (2010), and Double Ginger Sour Cream Bundt Cake with Gingered Strawberries (2011). I consulted the 'to make' list, but every listed cake seemed a bit difficult for me to handle on my own. I wasn't comfortable trying to whip eggs whites and fold them into a mixture for a mousse cake, I didn't want to attempt a tower of eight skinny layers while home alone, and as I discovered when I went poking through the pantry, we are completely out or have very little left of a lot of basic staples after all that holiday cookie baking plus a few of the remaining staples have soon-to-expire or expired dates on them. Whoops. In addition to figuring out what kind of cake to bake. I couldn't figure out when to bake it. His birthday is on a Sunday, so I couldn't bake it on his birthday and surprise him because he would be home. For the 3 days before his birthday, we are busy. I wasn't sure I wanted to bake his cake if we were not going to be home to enjoy it. I finally decided to bake it on Thursday. I also decided to go with a basic birthday cake. 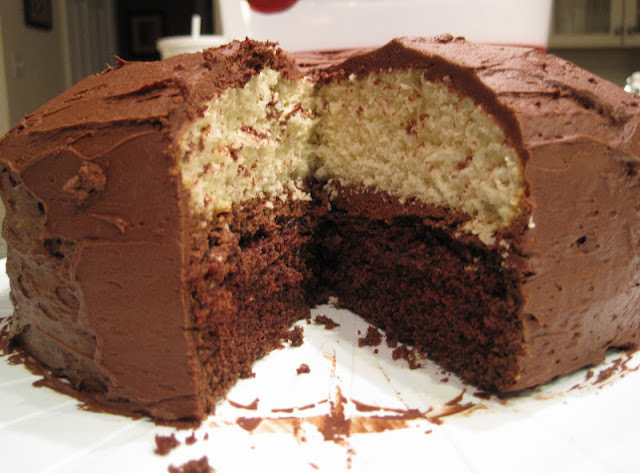 One chocolate layer, one white layer, frosted with chocolate icing. 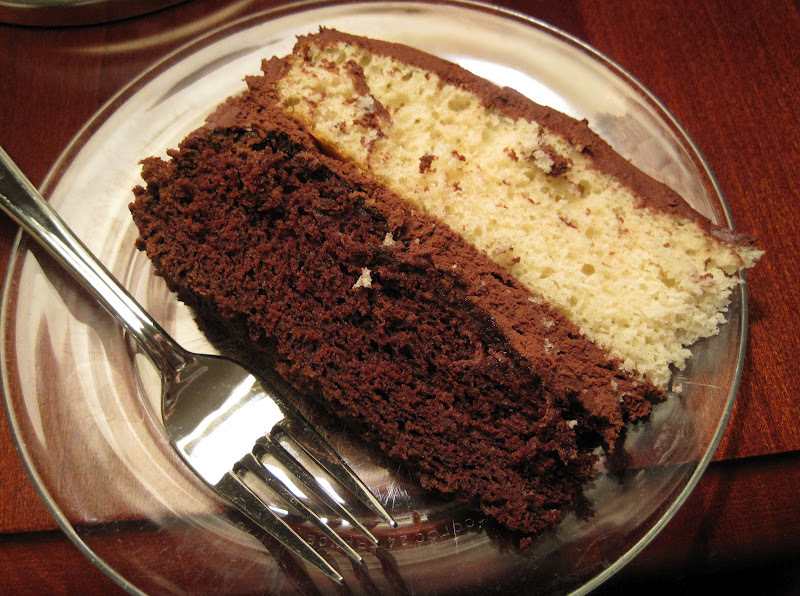 The chocolate layer recipe is from a very old Hershey's Fabulous Desserts Cookbook. The recipe is for one layer in a square pan. It is noteworthy in that the chocolate layer contains no butter and no eggs, but does use water, oil, and vinegar. I think this is the first time I've made an egg-less and butter-less cake.The yellow layer recipe is from my beat up copy of Better Homes & Gardens Cookbook, a one layer busy day cake recipe. 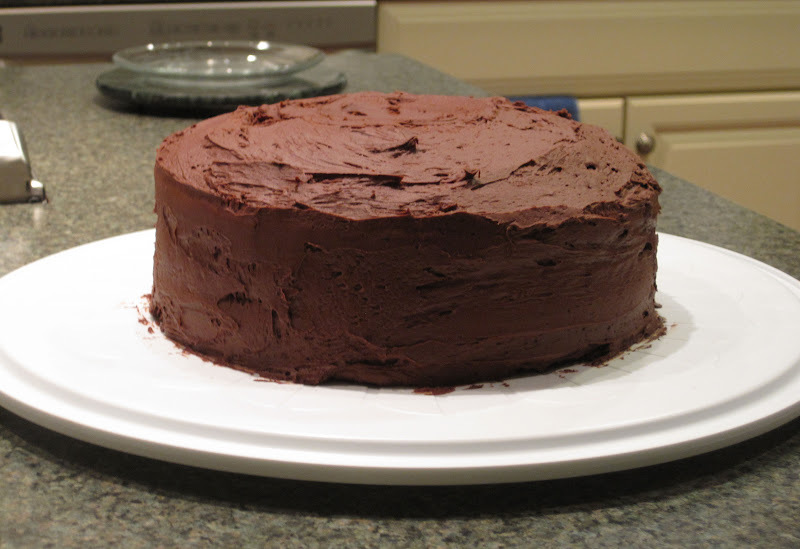 The chocolate frosting recipe is from the Hershey's book. It's a buttercream frosting (butter, powdered sugar, cocoa, milk, vanilla), and I used 3/4 cup cocoa for a dark chocolate frosting. 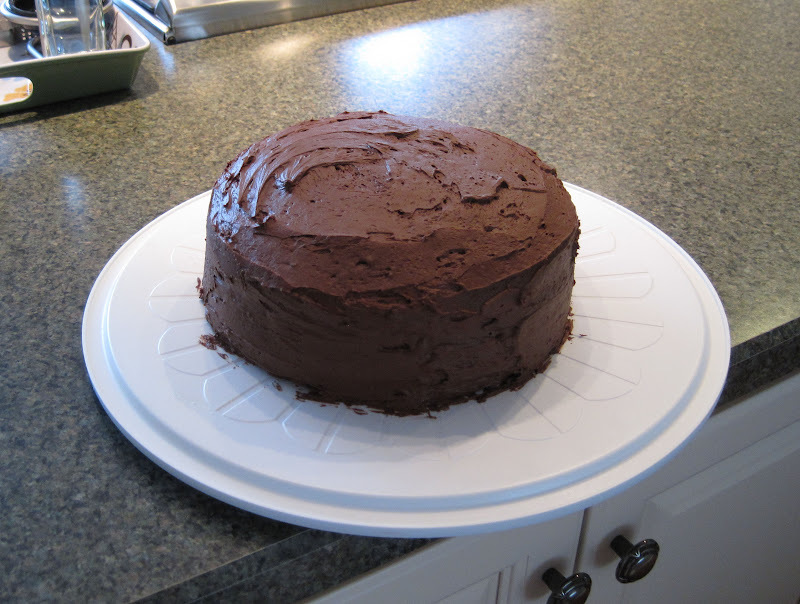 We cut into the cake last night when we got home from our meeting. 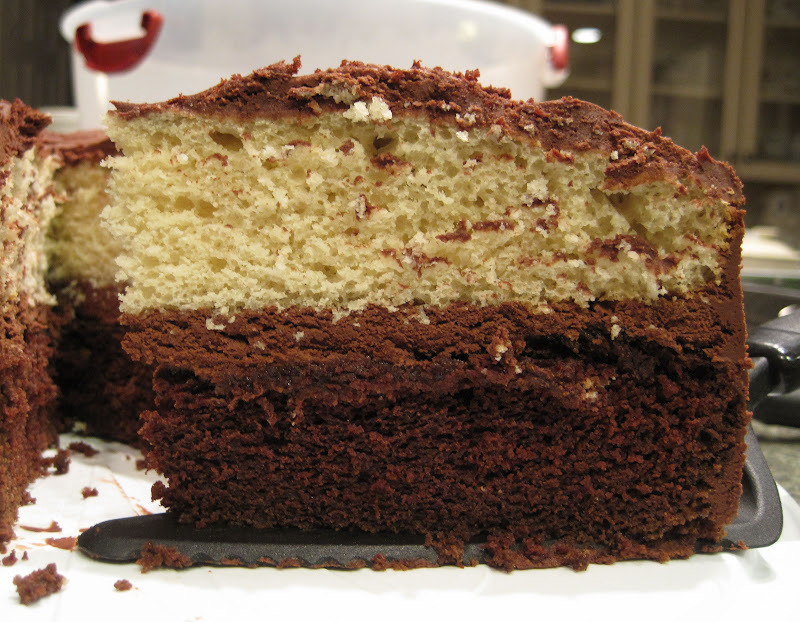 Both layers are moist, though I find the white layer to be a bit bland tasting. I added extra splashes of vanilla and milk to the frosting, and that seems to have helped make it a bit smoother/less grainy. I beat it for a long time to make sure everything was really incorporated. We both really dislike grainy frosting. I wanted to use our frosting tips to pipe a pretty design on the cake, but the frosting made just enough to cover the layers. Next time, I'd make an extra batch of frosting, not just so I can play with making pretty piped designs, but I felt a little like I was repeatedly smoothing and stretching the frosting to cover the cake. I thought there wasn't going to be enough! The best part: the top layer didn't slide off the bottom layer! So, happy birthday, SP. I'm glad you like your cake.